Over the weekend, Sissy posted some frantic cat-blogging when one of her's went missing. Thankfully, the prodigal feline returned. I did a little squirrel blogging that bordered on the tasteless. But now, not to be outdone, TigerHawk takes it to the next level: Donkey Blogging. Well, Jack I see your donkey and raise it an alpaca. 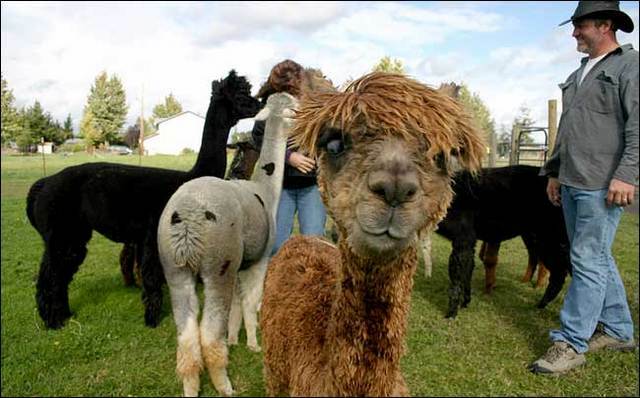 That Alpaca looks a lot like a guy I dated in college. Sissy has pretty much dominated the cat-blogging field, so there is no need to go there. Donkeys are cool, but my personal favorite is still eagle blogging.